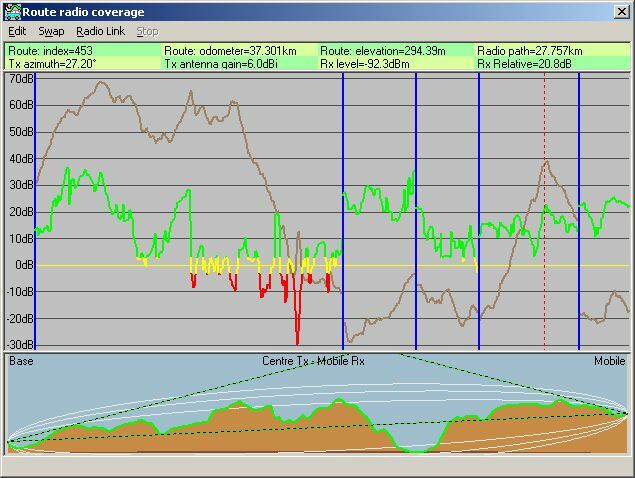 A further facility within the Route Radio Performance feature, is its ability to display the radio performance over a number of separate, unconnected, 'route segments'. This would be of considerable use if, for instance, it was required to examine coverage of a number of local access roads, or part of a motorway. Access to this feature is via the 'Object Editor' (Tools/Object Editor). The pane below shows the Object Editor displaying file 'L1X-base.plt' (which is located in the root of my Base Network Radio Mobile folder as in Route Radio Coverage). Additional road segments are to be added to this file as a demonstration. (Note that the Object Editor has been updated to show Altitude in metres, plus additional control button enhancements). If you require to Find the Best site for the Base Unit using Waypoints on this Route, Click here!